A silk embroidery from c.1825 by Frances Clifton who attended the Bethlehem Female Seminary in Pennsylvania offered by Carol and Stephen Huber at the Winter Antiques Show. It depicts a dramatic scene from Shakespeare’s ‘Coriolanus’. The Hubers specialise in needlework by young women stitched at school in the form of samplers, silk embroideries and needlepoints, which range in date from 1650-1850 and in price from $3000-500,000 and beyond. The attraction of these schoolgirl needlework pieces, added Stephen, is that they provide insight into the lives of these otherwise obscure makers. 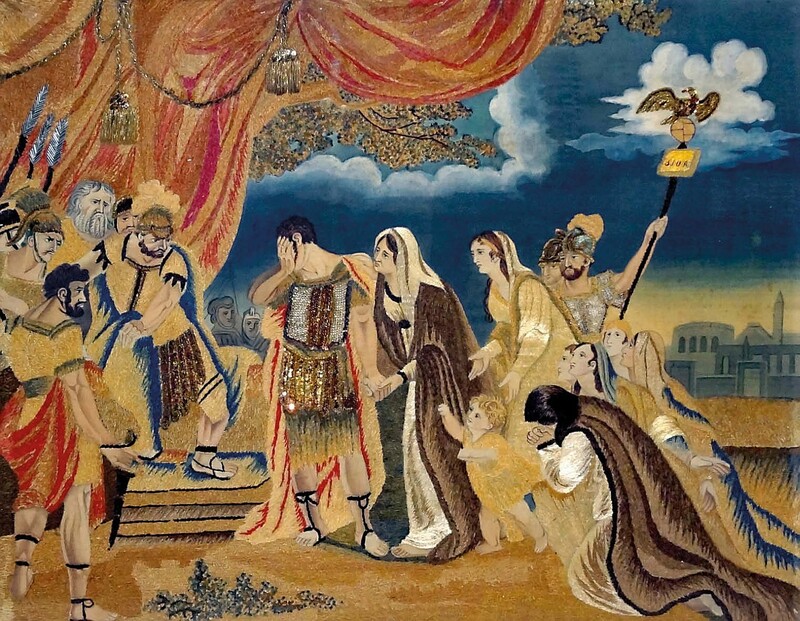 The 2ft 6in x 3ft 2in (76 x 96cm) embroidery, worked in silk, metallic thread and watercolour on silk, pictured above, was created c.1825 by Frances Clifton who attended the Bethlehem Female Seminary in Pennsylvania. She produced this large and lavish work there or later at a different school and the subject matter shows the kind of education such girls were receiving. It depicts a dramatic scene from Act V of Shakespeare’s Coriolanus when his wife Virgilia, son, mother and others venture out from Rome and successfully plead with him to not destroy the city.